Lieutenant General Henry Gordon Bennett CB, CMG, DSO, VD (16 April 1887 - 1 August 1962), Australian soldier, served in both World War I and World War II. Despite highly decorated achievements during World War I, including at Gallipoli, Bennett is best remembered for his role in the Fall of Singapore in the Pacific War when, as commander of the 8th Division, he escaped while his men became prisoners of the Japanese. Bennett (who was always known as Gordon) was born in Balwyn, Melbourne in 1887 and worked as a clerk with an insurance company. At the outbreak of World War I in 1914, Bennett was a major in a Melbourne militia battalion. He volunteered to serve with the First Australian Imperial Force and was appointed second-in-command of the 6th Battalion, which was part of the 2nd (Victorian) Infantry Brigade. During the landing at Anzac Cove on 25 April 1915, Bennett fought on the southern flank of the Anzac beachhead. He led 300 men of his battalion to an advanced position on Pine Ridge, south of Lone Pine. While directing the defence of this position, Bennett was wounded in the wrist and forced to retire to the beach for treatment. When the Turkish forces counter-attacked in the evening, the 6th Battalion force on Pine Ridge was isolated and wiped out to the last man. Instead of accepting evacuation on a hospital ship, Bennett returned to his battalion. In early May, the 2nd Brigade was selected to move to Cape Helles to reinforce the British forces for the Second Battle of Krithia. On 8 May, Bennett advanced with his battalion in impossible conditions. Bennett was the only officer of the 6th, and one of few in the 2nd Brigade, to survive the advance unscathed and with a handful of men, he achieved the furthest advance of the attack. He became commander of the 6th Battalion the next day. Back at Anzac on 7 August, the 6th Battalion was involved in one of the supporting attacks at the start of the Battle of Sari Bair. While the best known attack was made by the Australian 3rd Light Horse Brigade at the Nek, the 6th was required to make a similar attack against a neighbouring Turkish position known as German Officers' Trench from which machine guns enfiladed the Australian positions as far north as the Nek. Two attempts to capture the trench failed. A third attempt was organised and Bennett resolved to lead it himself but fortunately the commander of the 1st Division, Major General H.B. Walker, agreed to abandon the attack. In the capture of Pozix�res, Bennett's 6th Battalion suffered 190 casualties, the least by a considerable margin of the 12 battalions in the 1st Division. On 3 December 1916, he was given command of the 3rd Infantry Brigade and promoted to brigadier general, becoming at 29, the youngest general in the Australian army. He led the brigade for the remainder of the war on the Western Front. In 1919 Bennett moved to Sydney where he worked as a clothing manufacturer and public accountant. In 1922 he was appointed chairman of the State Repatriation Board and in 1928 became one of the three commissioners administering the City of Sydney. He was president of the Chamber of Manufactures of New South Wales (1931-33), the Associated Chambers of Manufactures of Australia (1933-34) and other professional organisations. Bennett was prominent in conservative political groups such as the All for Australia League and the Defence of Australia League. Bennett remained active in the AMF, although Australia's peacetime army was reduced to a mere skeleton. He was promoted Major-General in 1930 while in command of the 2nd Division. In 1937 he published a series of newspaper articles on defence policy which criticized regular officers and which led to his being censured by the Military Board. When World War II broke out in 1939, although only 52, Bennett was passed over for command of the AIF, the position going to General Thomas Blamey. The Chief of the General Staff, General Sir Brudenell White seems to have been opposed to Bennett being given an active command. A. B. Lodge, Bennett's biographer in the Australian Dictionary of Biography (ADB) comments: "Because of his temperament, he was considered unsuitable for a semi-diplomatic command, and one that involved subordination to British generals. Bennett was as scathing of British officers as he was of Australian regulars." Bennett was instead given a command in the Volunteer Defence Corps, the Australian version of the Home Guard. But General White's death in the Canberra air disaster of 1940 ended the obstruction of Bennett's career, and Bennett was appointed commander of the newly formed 8th Division, which was posted to Malaya in February 1941. Relations between Bennett and his superiors were not good. Lodge comments: "Bennett's dealings with British senior officers, especially with the general officer commanding, Malaya, Lieutenant General A. E. Percival, were devoid of harmony." In December 1941 the Japanese invasion of Malaya began. Along with the rest of the Allied forces, Bennett's division was soon forced to withdraw to Singapore. On 8 February 1942 the Japanese landed in Singapore, and on 15 February Percival surrendered to the Japanese. Bennett decided that it was his duty to escape from Singapore rather than surrender. He handed over command of the 8th Division to Brigadier Cecil Callaghan. With a few junior officers and some local Europeans, Bennett commandeered a sampan at gunpoint and crossed the Strait of Malacca to the east coast of Sumatra, where they transferred to a launch in which they sailed up the Jambi River. They then proceeded on foot to Padang, on the west coast of Sumatra. From there Bennett flew to Java and then to Australia, arriving in Melbourne on 2 March 1942. In April 1942 he was promoted to lieutenant general and given command of III Corps in Perth. In 1942 this was an important post, but by 1943, as the possibility of a Japanese invasion of Australia faded, it became a backwater. Bennett was told by Blamey that he would not be given another active command, and he transferred to the Reserve of Officers in May 1944. 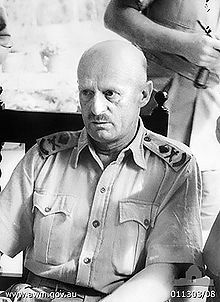 He soon published his account of the Malayan campaign, Why Singapore Fell, which was critical of Percival and other British officers. Blamey unsuccessfully tried to prevent the book's publication. The controversy over Bennett's actions became public in 1945, when the war ended and Percival was released from Japanese captivity. Percival, who had never got on with Bennett, accused him of relinquishing his command without permission. Blamey convened a court of enquiry under Major General V. P. H. Stanke, which found that Bennett was not justified in handing over his command, or in leaving Singapore. Veterans of the 8th Division, who were generally loyal to Bennett, protested against this finding. In November 1945, Prime Minister Ben Chifley appointed a Royal Commission under Justice George Ligertwood. The Commission concluded that Bennett had disobeyed Percival's order to surrender. While never questioning Bennett's personal courage, Ligertwood concluded that his action had been unjustified. Bennett's stated reason for leaving Singapore was that he had learned how to defeat the Japanese (but had been let down by British and Indian troops) and he was obliged to communicate his knowledge to military authorities. Yet, he had proved no more proficient than other commanders in Malaya and his tactics were outdated. Just as important to him was his wish to lead the Australian army, a consuming aspiration which had been sharpened by not being given an early command. His prejudice against regular officers and his ambition clouded his professional judgement at the most important point in his career. When his most cherished goals were in tatters, he convinced himself that blame for his failure lay with others." In 1948, LtCol Fry (an eminent military lawyer) published the opinion: The Royal Commissioner based his report on an interpretation of international law, and did not discuss General Bennett's action from the standpoint of Australian military law, which placed him under no inflexible obligation to remain on Singapore Island. Bennett became an orchardist at Glenorie, (now a suburb of Sydney), until 1955. He wrote a number of articles on military topics and served on the board of a number of companies. From 1960 to 1962 he was Chairman of Directors of MMI Insurance Ltd. He died on 1 August 1962 at Dural. Gordon Bennett, fepow-community.org.uk. Discusses the various published works which address Bennett's escape from Singapore. Peter Elphick, Singapore, the pregnable fortress, Hodder & Stoughton, London, 1995 ISBN 0-340-64990-9. Proposes an uncompromising portrait of the character.